Watery eyes, or excess tearing, is very common and has various causes. Regardless of the cause, having watery eyes can be annoying or painful. Furthermore, it is inconvenient to have people thinking you are crying all the time when you have an eye problem. Oftentimes, people are unaware that something can be done to fix this since they have learned to live with their watery eyes. Tears are vital for maintaining the overall health of the eyes. When you blink, the tears create a natural film over the eye that protects them from irritants, germs, and foreign particles. Tears also provide natural lubrication to the eyes and a crisp clear surface. Tears are made by the lacrimal gland, which is located in the upper outer corner of the eye. When you blink, tears get spread across the eye by the eyelids and any excess goes to tiny openings on the edge of the eyelids called punctae. 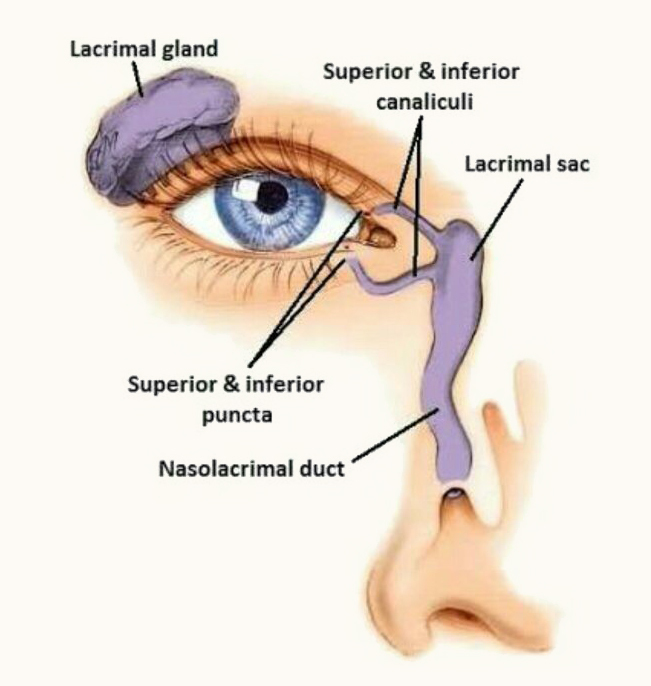 Once they enter the punctae, the tears move down into tiny channels called canaliculi that connect to the tear sac and then to the tear duct in the nasal area. A blockage, whether by scar tissue, infection, trauma, or tumor growth, can cause the tears to back up and create a watery eye. What are the Symptoms of Tear Duct Obstruction? If you suffer from any of these symptoms, you should consult a facial specialist that is trained in oculofacial plastic surgery such as Dr. Vivian Schiedler. During the consultation, you may learn that you need testing to find the reason of your watery eyes and Dr. Schiedler will take the time to go over treatment options so that together you can choose how to move forward. Watery eyes can develop for a number of reasons, from something as benign as allergies to something as serious as a tumor. The cause of excess tear production will dictate whether surgery is needed. Learning about different causes of watery eyes can alleviate anxiety and help you determine whether a consultation is urgent. The following list encompasses some of the reasons for watery eyes. Congenital malformations of the lacrimal system – Sometimes children are born without a fully developed tear drain. Sometimes a simple probing procedure under general anesthesia will open it up completely, or sometimes a small flexible temporary tube needs to be placed to encourage the tear drain to stay open. Conjunctivochalasis – This is an age-related eye disease where excess folds of the conjunctiva, or surface membrane of the eye, slides around when blinking. When the membrane becomes loose and swollen, it can sit over the edge of the eyelids and block the tears from entering the tear drain. Dry eye – Seems odd, but a dry eye or any irritant on the eye surface can actually result in watery eyes. This is because the body will receive this signal (dry eye) and produce more than average tears to overcome the dryness or irritation. Eyelid problems – Loose, stretchy eyelids can lead to a weak blink. Sometimes the tear drain hole, or punctum, flips away from the tears due to excess stretchiness of the eyelid. This can prevent proper tear drainage off the eye. Injury or scar tissue – Any sort of injury or trauma at or near your eye can cause bone damage leading to scar tissue that obstructs the flow of tears. Scar tissue can also develop due to autoimmune disorders. Infections and/or inflammation – An infection in the tear drain, along with chronic and allergic sinusitis, can lead to your tear duct becoming blocked. Tear duct blockages – Women after age 40 are particularly prone to slow onset of tear drain blockage in the nasal area. This may be due to having smaller passages than men, or hormonal changes, or possibly years of eye makeup going down the drain causing inflammation. Individuals who suffer from chronic eye inflammation, chronic allergies or sinus problems, and women past the age of 40 have a higher risk of developing watery eyes as a result of blocked tear ducts. A variety of treatment options exist, and the right one will be determined by the cause of the watery eye. Sometimes multiple procedures are needed in stepwise fashion. For a blockage in the tear drain – The most common site for blockage is in the tear duct near the end of the drainage passageway into the nose. Partial blockages may only require a stretching of the duct with a very thin soft silicone stent. This helps to open up the drainage to allow tears to flow. More aggressive treatments may be needed for complete obstructions. For dry eyes – Finding and treating the source of the ocular surface inflammation and dryness may slow down the reflex watering. For eyelid laxity or ectropion – A simple tightening of loose eyelids will strengthen the blink and pump the tears more effectively. This is an excellent treatment for those suffering from age-related causes. For conjunctivochalasis, or a loose and swollen membrane on the eye – This tissue may bunch up on the edge of the eyelid and block the tears from flowing along the eyelid margin. Dr. Schiedler, as a skilled ophthalmologist and reconstructive surgeon, can perform an ocular surface reconstruction to remove and repair the damaged membrane. A healing amniotic membrane will then be placed to restore the tear reservoir deep inside the lower eyelid, and smooth out the surface of the eye. This is a short outpatient surgery with high success and quick recovery. Amniograft is a tiny piece of clear tissue harvested from amniotic membrane that surrounds a baby in the womb. Because it has remarkable healing properties, it can be used very successfully to restore the eye surface and achieve excellent cosmetic results. The outcome in 2 to 3 weeks is a white quiet comfortable eye rather than a pink angry looking eye. For blockage due to inflammation – If a blockage is caused by swelling, tear drain surgery is not usually needed. Treating allergies with antihistamines and steroid nasal spray may help open the tear drain in the nose. If it is a complete blockage, the watery eye may also become sticky, goopy, and more prone to infection. In these cases, a type of lacrimal system surgery is performed to reconnect the tear sac to the nose, bypassing the blockage in the duct. This is called a dacryocystorhinostomy, or DCR. It is typically done under deep sedation or general anesthesia on an outpatient basis and has a high success rate. Recovery is relatively short, and most patients return to work after a few days. When tear duct surgery is needed, the prognosis is favorable. When DCR is performed, a light bloody nose for 1 or 2 days is to be expected. Most patients do not feel much if any pain after DCR surgery. Recovery is relatively short with most patients able to return to work after a few days, but it is advisable to avoid strenuous activity for one week, and avoid nose blowing for two weeks. To eliminate scarring and for natural-looking results, you should always entrust your care to someone who is not only skilled in facial surgery but also knowledgeable in the eye and facial anatomy. Dr. Vivia Schiedler is trained in ophthalmology and microsurgery and has many years of experience performing delicate eye surgeries often requiring tiny sutures that can only be seen under magnification. Using these sutures allows for better visual cosmetic results. Dr. Schiedler takes an individual personal approach to every patient, so if you suffer from watery eyes and are in need of medical attention, contact Oasis Eye Face and Skin to schedule a consultation. Dr. Schiedler and her team will take the time to listen to your concerns and examine your condition to arrive at an accurate diagnosis and treatment plan. Call 541-500-0165 to book your appointment.